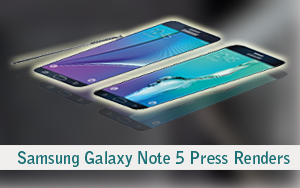 As the famous Korean company Samsung has announced the date of its Unpacked event, we got a glance of the press images of its upcoming flagship phones Samsung Galaxy Note 5 and Samsung Galaxy S6 Edge Plus. The leaked renders really match with the previous leaks and It's exciting to see the official images of Samsung's upcoming high-end phablets. Is not it ? After all the announcement of the Galaxy Note 5 and Galaxy S6 edge+ is scheduled for less than two weeks from now on August 13, and how tight of a seal can you keep on those leaks? The press renders in question come courtesy of @evleaks, and given his track record and previous live images, which popped up here and there, you can bet they are the real thing. The Samsung Galaxy Note 5 sports a bolder controls design, its capacitive Task switcher/Back buttons nearly twice as large as those on the Galaxy S6 edge+. The thin bezels also catch our eye, and the groove in the top of the S-Pen keeps entertaining our minds, trying to figure out if it will be clickable or not. 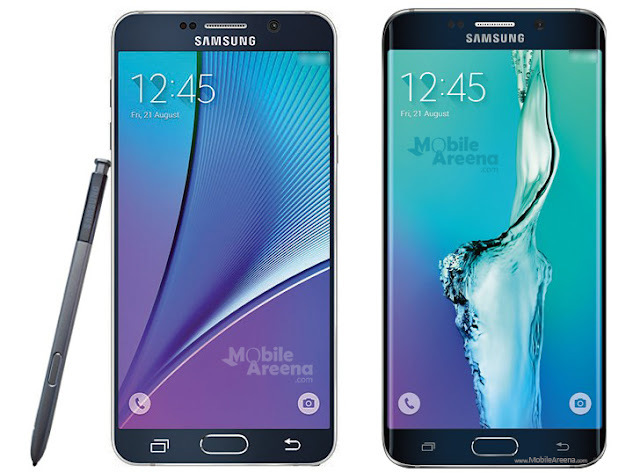 Meanwhile, the Galaxy S6 edge+ is little more than a Galaxy S6 edge on steroids, in terms of appearance, that is. Subtle details like the straight top and bottom edges, as well as comparatively thinner bezels versus its overall dimensions tell us it's the new model.